This 'blog has been bit hard by a bug in a plugin. WP-Sweep includes an ostensible ability to purge categories and tags that are not used for any entries. Unfortunately, the programmer made an error such that the categories and tags purged are any not used in generally accessible entries; tags and categories used exclusively in restricted entries are therefore purged. Still more unfortunately, I did not discover the bug until after I had made various content changes; simply restoring a previous version of the database would undo those changes. I don't remember what they were, and my only records are the database and saved versions thereöf. I will, over time, try to repair the damage. Readers may have noticed some technical problems with this 'blog over the previous few days. I believe that the problems are resolved. Recently, browsers have become concerned to warn users when they are dealing with sites that do not support encryption. Simply so as not to worry my visitors, I have tried to support the HTTPS protocol. But I found that WordPress was still delivering some things with the less secure HTTP protocol, which in turn was provoking the Opera browser to issue warnings. At the WordPress site, I learned that I needed to modify two fields. Unfortunately, changing these two fields broke my theme — my presentation software — so that fall-back text, rather than the title graphic, was sometimes displayed; but I didn't discover the breakage for a while, because the symptom wasn't always present. Ultimately, I realized that something were amiss. I tracked the problem to inconsistencies in how WordPress determines the protocol of the URI of the 'blog versus that of the directory holding the themes. I recoded my theme to handle this inconsistency. (In the process of this recoding, my 'blog was made still more dysfunctional over several brief intervals.) My code is now sufficiently robust that it should not break if WordPress is made consistent in these determinations. I've made some changes to the code that determines the presentation of this 'blog, in order to make it more useable with devices such as cellular phone sets and tablets. Some visitors will observe substantial improvement. There will probably be more changes to come, and during my attempts to effect such changes, the 'blog may occasionally behave dysfunctionally. If you observe a persistent problem in presentation, even if one long-standing, then please contact me, being as precise as you can about which device, operating system. and browser you use. This site now supports HTTPS connections. For most visitors, an HTTPS connection will mean no more than that they won't receive a spurious warning from their browsers about the site being insecure. For friends with accounts giving them access to restricted entries, HTTPS will allow them to be less concerned about whence they log into the site. To-day, I found myself unable to log-in to this 'blog. I got a diagnostic that I were entering the wrong password. I don't want to burden my readers with a detailed retelling, but what had actually happened was that an up-date of WordPress rejected my password — it wasn't that I were entering the wrong password; it was that the password that I was entering was now prohibitted. On top of the login code misreporting the problem, the code for resetting the password wouldn't tell me why my password was being rejected. But it was rejected for containing a particular sub-string; and when I removed that sub-string, the password was then accepted. If you understand passcodes (perhaps in part from reading my previous entry in which they were discussed), then you should see that there is something literally stupid in the WordPress software. Let's say that the forbidden sub-string were 8675309 and that my password were X.52341-hunao-8675309.Y . If I drop the 8675309 , the password becomes X.52341-hunao-.Y . That is now accepted, though it is less secure! If a would-be intruder knew where in the original password 8675309 appeared, and knew the length of the password, then the password would effectively be p1p2…p148675309p22p23 where each pi were an unknown character, and the new password would be p1p2…p14p22p23 so that the two passwords would be equally secure!. (Either way, an intruder must find a sequence of sixteen unknown characters.) But, as it is, would-be intruders wouldn't be sure that the sub-string appeared, let alone where in the code it would appear, nor how long the password were. One could, in fact, conceptualize the sub-string 8675309 as if it were a single character of extraordinary length (a macro-character) and of great popularity which character might appear within a string of equal or greater length, in which case prohibiting the sub-string would be rather like prohibiting the use of E .
That's not to say that common sub-strings should simply be accepted as passwords or within passwords. A great many systems have been hacked because someone foolishly used passwords such as password , root , or batman . But, instead of rejecting a password because it contained a popular sub-string, the software could, for example, test to see whether the password would be secure if the sub-string were excised, in which case it should be at least slightly more secure if the sub-string were retained. Yester-day, I made the unhappy discovery that seven entries to this 'blog that were intended to be publicly accessible have instead been restricted. Apparently the restriction was caused by a bug in a WordPress plugin or in WordPress itself. The bug doesn't seem to have bitten since 2010, so I believe that it were resolved by some software up-date. I used a little MySQL to set things straight, then went over a back-up copy of the dB to identify all the affected entries, so that I could list them here. Installing Firefox 3.0 under Red Hat Enterprise Linux 5.x [17 June 2008] and that second IT entry now has very little marginal value except to someone making odd software choices. Thoughts on Boolean Laws of Thought [13 February 2010] I very much regret that the entry on intellectual property has apparently been hidden from most visitors for more almost eight years! I had been in the mood to try a change. I constructed some new letters of a general form that I like, which used to be popular for the cover titles of pulps and of comic books. I decided to give them a metallic look (which was done by layering gradient fills of blue-grey). But my big problem with the results was readability, especially of the subtitle. Changing the subtitle fill from a metallic texture to a solid white helped somewhat, but readability still wasn't what I wanted. The problem was even worse when displayed on my tablet, which resizes images to suit itself and can thereby further blur graphics. I may not be done with these experiments though. I've been thinking of converting the visual theme of this 'blog into a meta-theme, whose graphic components vary, perhaps as a function of time or perhaps randomly or pseudo-randomly. I have played-around with elements for a distinct presentation to mobile devices, but I note that the screens of typical mobile devices are now fairly large and of high resolution. Meanwhile, the current presentation actually seems pretty good on my agèd cellular phone, which has a screen with a 3.1-inch diagonal, with 480×640 pixels. The extended quiescence of this 'blog has largely been an artefact of my limiting of various activities as I bore-down on critiquing Production of Commodities by Means of Commodities , a work of heterodox political economy by Piero Sraffa. The task has been thoroughly unpleasant, because there is so very much wrong with his work and because he writes in an obscure manner. At the same time, I have been dealing with depression intensified by personal circumstances. Had I allowed myself to step away from the project more than I did, I might never have finished it. I have not, indeed, finished it; but, on Wednesday morning, I completed a first draft of the article. That draft is now in the hands of some of the other economists whom I know. (Naturally, I have since found things that I want to change, though none of these represent a major issue.) So I think that I will be back to writing more entries here. One of the economists who has graciously said that he would take a look at the article (not-withstanding that it is monstrous in size!) asked me what motivated my writing of it. Over many years, I have repeatedly been annoyed by encounters with those who draw upon PoCbMoC . More recently, I have been concerned by increased popular support for administrating economies (which support happens to be egalitarian or quasi-egalitarian); and this book is part of the infrastructure of the experts who defend such administration. Further, at the time that I finally began actually working on this article, I felt stalled-out in my paper on the axiomata of qualitative probability. (That paper was and is a rat's nest, in which the basic propositions are not currently each perfectly orthogonal to all others.) In a sense, then, this article on Sraffa's book was intended as a break, though I quickly discovered that the task was going to be far more onerous than I had presumed. Production of Commodities by Means of Commodities is the central text of neo-Ricardian economics, and a core text of post-Keynesian economics; it is also an important source for a variant form of Marxism that would abandon the labor theory of value. If I can get my article published in a reputable journal, that publication will eventually be the death of neo-Ricardianism and of the aforementioned variant of Marxism; I don't know enough about post-Keynesianism to know how well they might do without PoCbMoC . Some of my criticisms are relatively minor, but some of them strike at the heart of the work. those reviewers most likely to feel sufficiently competent to examine my article are admirers of Sraffa. I intend never again to pore over a work, even as short as PoCbMoC , when it is discernibly crack-pot. As I told a friend, I have been doing my time on the cross here; let someone else go after other such thinkers. I am capable of original work of significance, and that is how I intend to spend my remaining time qua economist. This 'blog was begun as I left LiveJournal, appalled by its evolving policies under its second and then third owners. One might reasonably conceptualize this 'blog as a continuation of that which I had at LJ, and some of the entries of this 'blog are recyclings of entries from the earlier 'blog. None-the-less, this 'blog has become very different from its predecessor. LiveJournal is a social-networking site; part of the reason that it has withered is that its users migrated to more successful social-networking sites. My present 'blog doesn't work that way. I have recurring readers, but there's nothing much like the Friends feed of LJ or of Facebook. There is no centralized connector of interests (as on LJ). I have regular readers, but they are likely to use an RSS aggregator (such as Flipboard) and less likely to comment (especially if they are using such an aggregator). I get far more irregular visitors, who are here by way of Google (or of some other search service), grabbing some information, and not so much as visiting any page here other than their entry pages. So it doesn't feel appropriate to offer mundanities of the sort that I would relate to a neighbor or to a friend on the telephone. My public entries tend to be things that I imagine strangers would appreciate reading. The restricted entries (basically accessible to friends who followed me as I migrated from LJ) are almost entirely personal; but a reader is required to make a special effort to access them, so they are not about ordinary events; they are usually very personal. With entries to this 'blog thus typically requiring more thought, there are generally fewer of them, and the 'blog becomes dormant when I cannot — or believe that I should not — give thought to those entries. A number of visitors have pinned images from this site to their boards at Pinterest. 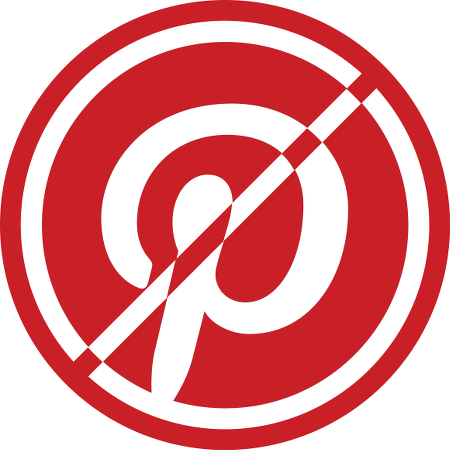 These actions wouldn't bother me, except that I am very offended with the way that Pinterest attempts to compel visitors to log-into their site to look at boards, and to register an account even to contact them over an issue. Pinterest throws a mask between their content and a visitor (and have tweaked the coding of the mask to prevent its blocking). I used to have a Pinterest account, but I walked away from it over the demand that I be logged-in to see what my then-girlfriend had pinned to her boards. I find now that Pinterest has the chutzpah to mask the specific set of images from this site pinned to the boards of various of their users. to the headers of this 'blog. This obstruction is imperfect, but Pinterest uses Amazon Web Services, and I don't want to block everything else that does. Nor do I want the code for this 'blog to test each visit to see whether the Pinterest client is attempting to effect a pinning.